The Samsung Galaxy S 5 is a smartphone that runs on the Android operating system. It has a 5.1-inch touch-screen display, a 15.9-megapixel camera, and a virtual QWERTY keyboard. 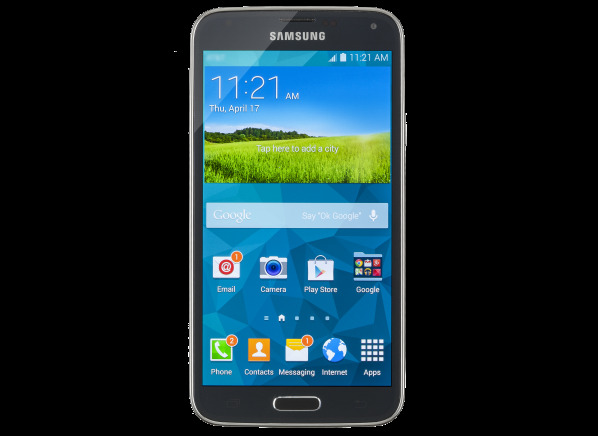 The Samsung Galaxy S 5 is a smartphone that runs on the Android operating system. It has a 5.1-inch touch-screen display, measures 5.6 by 2.9 by 0.3 inches and weighs 5.1 ounces. The Galaxy S 5 has a 15.9-megapixel camera that can record high-definition video, a front-facing camera, and a music player. It also features a virtual QWERTY keyboard that's useful for messaging and Web searches. This phone has WiFi, Bluetooth for wireless hands-free communication, DLNA, and GPS navigation capability. Web browsing, e-mail, and texting capabilities are also included. It can act as a mobile hotspot for WiFi-enabled devices. This Samsung phone has a standard 3.5mm jack. It has 16GB of built-in memory, and supports memory cards of up to 128GB. Results in the following chart are gathered from Consumer Reports’ 2018 Summer Survey of 132,374 smartphones owned by members who purchased a new device between 2013 and 2018. Our predicted reliability ratings are based on a statistical model that estimates problem rates within the first 2 years of ownership, for smartphones that are not covered by an extended warranty or service contract. We also adjust for the median number of minutes of use per day. The median in our survey was 180 minutes (3 hours) per day. Higher ratings are indicative of better reliability. Brands receiving a red or orange rating cannot be recommended by CR at this time. Our owner satisfaction ratings are based on the proportion of members who are extremely likely to recommend their smartphone to friends and family. LTE LTE Indicates the phone supports a 4G LTE (Long-Term Evolution) data network. WiFi WiFi These phones have built-in WiFi that gives them fast Internet and e-­mail access through home networks and WiFi hotspots. Phones can use the connection to share content, or make calls using Voice over Internet Protocol, though the latter may not be available from all providers. Bluetooth Bluetooth Bluetooth support typically means the phone works with wireless Bluetooth headsets and most hands-free car systems, and it can wirelessly exchange pictures, contacts, and other information with other compatible Bluetooth devices, such as a computer, cell phone, speaker system, smartwatches, or printer. Not all Bluetooth phones support all these capabilities. NFC NFC Indicates the phone supports NFC (Near field communication) data typically used for wireless payment such as Apple Pay and Android Pay. Headphone jack (3.5mm audio jack) Headphone jack (3.5mm audio jack) Newer phones are starting to not include the standard 3.5mm headphone jack and instead are using the USB C port. This requires a different pair of headphones or an adapter if you want to continue using your favorite headphones. Fingerprint reader Fingerprint reader A biometric fingerprint reader for logging into your smartphone and certain apps. Facial recognition Facial recognition The selfie cam can be usedt to scan your face for logging in to your smartphone and certain apps. World phone World phone Indicates the phone supports international frequency bands for coverage abroad. May not be available from all providers. Camera (megapixels) Camera Specifies, in megapixels, the maximum resolution of the rear-­facing camera. Camera flash Camera flash Some phones have a built-in camera flash, which is helpful when taking pictures in dark environments. Camera recording resolution Camera recording resolution The maximum recording resolution of the phone's primary video camera: Ultra HD (4K), 1080p, 720p, or SD (Standard Definition). Front-facing camera (megapixels) Front-facing camera Specifies, in megapixels, the maximum resolution of the front-facing camera. A camera with a 0.3 megapixel value is also referred to as VGA. Models with an NA don't have a front-facing camera. FM radio FM radio Phones with a built in FM radio require a special stereo headset be plugged into the phone to use the radio. The headset acts as both the audio output and the radio's antenna. This feature may not be available from all providers. Headset Headset Indicates if a headset (earphones) is included. This feature may not be available from all providers. Battery removable Battery removable Shows whether or not the model has a removable battery. Music player Music player Indicates the phone has a built-in MP3 player. Most players have full capabilities, allowing you to sort or view tracks according to genre, album or artist, playlists, etc. They also typically have more than one playback option, such as repeat and shuffle. The small number of phones that lack these convenient features are rather cumbersome to use. Voice command Voice command This feature allows you dial numbers from your phone book by speaking the name, without the usual training. You can also dial numbers by pronouncing the digits. Voice memo Voice memo A built-in voice recorder. Speakerphone Speakerphone Useful for hands-free conversations when a headset is unavailable or impractical. GPS navigation GPS navigation Phones that support GPS Navigation services conveniently integrate GPS with maps and search engines to give you real-time, spoken, turn-by-turn directions to an entered address, or to help you find nearby businesses by name or category, such as Joe's Pizzeria or hospitals. We indicate which phones have GPS navigation capability. The service for nearly all models doesn’t cost extra, but on some models it can cost extra. Other providers Other providers Available for purchase on these other service providers. The performances or features of these related phones may differ from provider to provider. Rugged Rugged This is a rating. If the phone survived 50 or more drops and being submerged in 1 meter or more of water, then it is considered rugged. Height (in.) Height Height is measured to the nearest tenth of an inch (folding phones are measured closed). This value may vary slightly by provider. Width (in.) Width Width is measured to the nearest tenth of an inch (folding phones are measured closed). This value may vary slightly by provider. Depth (in.) Depth Depth is measured to the nearest tenth of an inch (folding phones are measured closed). This value may vary slightly by provider. Weight (oz.) Weight Weight is measured to the nearest tenth of an ounce, with the battery installed. This value may vary slightly by provider. Total storage provided (GB) Total storage provided Total storage (gigabytes) provided, both internal and external, for the operating system, apps, content, and etc. Availability for models with multiple memory storage capacities are subject to change. Available storage (GB) Available storage Storage that is left available to the user once the operating system and applications that come with the phone are installed and set up. RAM (GB) RAM Random Access Memory. RAM is where the phone keeps the pieces of the operating system and applications that are currently being used. It is much faster than storage and an SD card so if you have enough for all your needs the phone will respond much more quickly. Memory card slot Memory card slot Phones that have slots that accept memory cards, typically microSD, allow you to conveniently expand storage capacity by up to 256GB, and sometimes even more. The removable card may be hard to access. Case style Case style Indicates the phone design: folding, rectangular, sliding, swivel, or a combination. Other capacities available (GB) Other capacities available Other storage capacities available at time of testing.